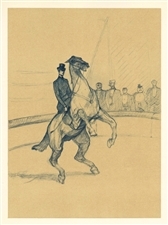 Toulouse-Lautrec was fascinated by the circus, and he executed a series of beautiful colored pencil drawings on this theme. 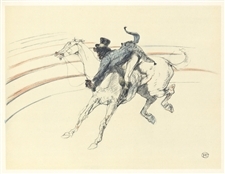 These were made into limited edition lithographs at the Mourlot Studio in Paris in 1952. 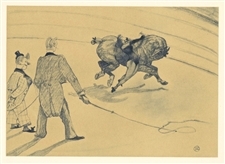 We are proud to offer them here, appealing to both collectors of Toulouse-Lautrec prints and aficionados of the circus. 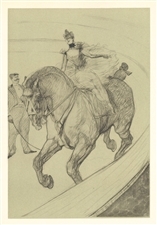 Medium: lithograph (after the colored pencil drawing). 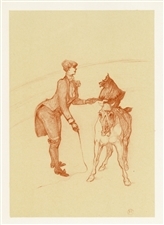 Beautifully printed in Paris in 1952 by Mourlot Freres in an edition of 1500. The total sheet (including margins) measures 12 3/8 x 9 5/8 inches (315 x 245 mm). 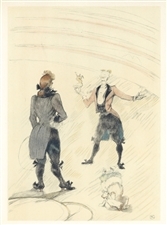 Signed in the stone with the Toulouse-Lautrec monogram signature (not hand-signed). 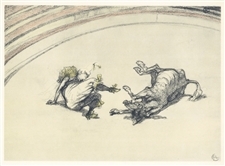 Toulouse-Lautrec lithograph | Circus "Chocolat, scene comique"
Toulouse-Lautrec lithograph | Circus "Dresseur de chiens"
Medium: lithograph (after the colored pencil drawing). 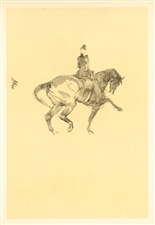 Beautifully printed in Paris in 1952 by Mourlot Freres in an edition of 1500. The total sheet (including margins) measures 12 3/8 x 9 5/8 inches (315 x 245mm). Not signed. 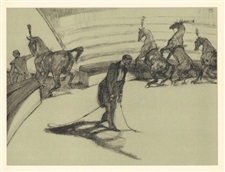 Medium: lithograph (after the colored pencil drawing). 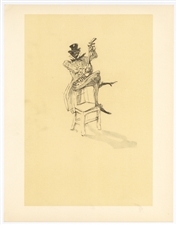 Beautifully printed in Paris in 1952 by Mourlot Freres in an edition of 1500. The total sheet (including margins) measures 12 3/8 x 9 5/8 inches (315 x 245mm). Signed in the stone (not hand-signed). 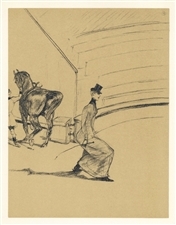 Toulouse-Lautrec lithograph | Circus "Dans les coulisses"